The ability to develop and implement new strategies quickly and effectively is crucial for any organization. Despite its strategic importance many organizations fail at strategy implementation. Because of its high failure rate, achieving successful strategy implementation remains a continuing challenge for managers. This article presents the strategy execution framework – a comprehensive management model that allows managers to master one of the greatest management challenges – successfully implementing strategies. The powerful framework incorporates 18 success factors that are related to the process, content and context of strategy implementation. Collectively, these tools help organizations plan and implement and manage their strategies but also monitor, learn and adapt their strategy implementations to achieve sustainable organizational success. Strategy implementation has a substantial impact on organizational performance (Hrebiniak and Joyce, 1984), is crucial to organizational effectiveness (Sproull and Hofmeister, 1986) and is essential for the success of any organization (Noble, 1999). The successful implementation of strong and robust strategies gives any organization a significant competitive edge. Strategy implementation is even more important in current turbulent organizational environments. The environment of public and private organizations is increasingly dynamic (Volberda, 1996; D’Aveni, 1994). Developments such as the globalization of markets, rapid technological change, deregulation of industries, a shift of organizations from the public to the private sector and the increasing aggressiveness of competition have radically altered the competitive rules (Volberda, 1996). These environmental developments have resulted in strong pressures for frequent strategic change (Baden-Fuller and Volberda, 1997; Thomas, 2002) to maintain a ‘fit’ with these changing environments. In turbulent environments, the ability to develop and implement new strategies quickly and effectively may well mean the difference between success and failure for organizations (Drazin and Howard, 1984; Hauc and Kovac, 2000). Well-formulated strategies only produce superior performance for organizations when they are successfully implemented (Bonoma, 1984). Even the best-made strategies are worthless if they cannot be successfully implemented (Schilit, 1987). Strategic success requires an appropriate strategy but also requires that the strategy is implemented successfully (Hussey, 1996), and timely. Organizations often fail at strategy implementation. Few intended strategies are successfully realized (Mintzberg, 1990), despite its strategic importance to any organization. Survey after survey reveals that strategy implementation is a top priority for executives (Harvard Business Review, 2006). However, fewer than 15 percent of organizations around the world report that they are successful at strategy implementation (ibid). Various studies have reported implementation failure rates at 60 to 90 percent (Kaplan & Norton, 2005). The majority of strategies fail in the strategy implementation phase (Noble, 1999). After a comprehensive strategy or single strategic decision has been formulated, significant difficulties are often encountered during the following strategy implementation process (Alexander, 1985). A widely shared experience is that all too often plans do not work out as intended (Wernham, 1984; Nutt, 1999). Many organizations have a fundamental disconnect between the formulation of their strategy and the implementation of that strategy into useful action (Kaplan, 1995).This is the strategy implementation problem: ‘the all too frequent failure to create change after seemingly viable plans have been developed’ (Nutt, 1983). Achieving successful implementation remains a continuing challenge for managers responsible for executing strategies (Cravens, 1998). Strategy implementation is a multifaceted and highly complex organizational phenomenon (Wernham, 1985; Noble, 1999). The process tends to be messy, ambiguous and often involves many departments in the organization (Noble, 1999b, Schofield, 2004). Part of this complexity arises from the social and political aspects of strategy implementation, which need to be taken into account. Hence, there is a growing recognition that the most important challenges in strategic management are in strategy implementation (Flood et al., 2000). To contribute to the understanding of strategy implementation, we developed a comprehensive framework for strategy implementation. The Strategy Execution Framework emerged from a qualitative survey of 55 executives within 44 public and private organizations (see Figure 1). Using Pettigrew’s (1985) process, content, and context framework, 18 success factors for strategy implementation were identified and categorized into three groups: factors related to the context in which a strategy implementation takes place, the process by which the strategy is implemented and the content of the strategy implementation. This framework allows for a holistic view of strategy implementation. 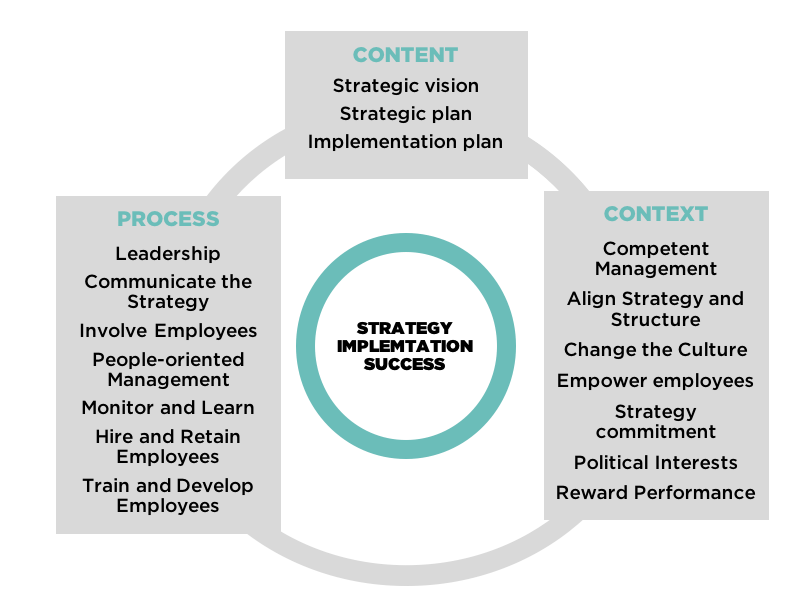 The strategy execution framework is a comprehensive management model that allows executive and managers to master one of the greatest management challenges – successfully implementing strategies. This powerful framework incorporates 18 ‘hard’ and ‘soft’ success factors or tools related to the process, content and context of a strategy implementation. Collectively, these tools help organizations plan and execute their strategies but also monitor, learn and adapt their strategy to achieve sustainable organizational success. The content of strategy implementation refers to the product or ‘what’ of the strategy process. The following three practices increase strategy implementation success. Successful strategy formulation and implementation begins with the formulation of a sound and clear strategic vision by top management. A strategic vision describes the desired future state of the organization. The strategic vision helps clarify the direction in which an organization is to move (Kotter, 1995). A clear and well-formulated strategic vision is a key requirement for effective organizational redesign (Miles et al., 1995). The strategic vision needs to be clearly defined and well formulated (Hussey, 1996). The strategic vision needs to be attractive and easy to communicate toward organizational members, customers, shareholders, and other relevant stakeholders. The simpler the strategic vision is, the easier it is to understand and execute for organizational members. A clear and attractive strategic vision increases the confidence of employees in a successful outcome of a strategy implementation effort. An attractive and ambitious new strategic vision can help to attract and unite organizational members and stimulate them to increase their effort (Trice & Beyer, 1991). However, the vision must also realistic and feasible. An unrealistic strategic vision reduces the motivation and commitment of organizational members. After formulating the strategic vision top management needs to develop a strategy that is able to achieve the strategic vision. A strategy is ‘a combination of the ends (goals) for which the firm is striving and the means (policies) by which it is seeking to get there’ (Porter, 1980: xvi). A strategy serves as a roadmap to get where a company wants to go. In order to guide the strategy implementation effectively, the strategy needs to be realistic, based on a sound idea and be well thought out. No implementation can save a strategy, which is not feasible or sound to begin with. After the strategy is developed, it needs to be discussed with those who have to execute it, such as middle managers and key employees to assess whether the strategy is sound, realistic and feasible. Not only needs a strategy be sound and feasible it needs to be clear also. Organizational members who have to implement the strategy need to have a clear understanding of the strategy. They need to understand what the (operational) objectives of the strategy implementation are and what the consequences are for them as individuals. Furthermore, organizational members need to know what to do to make the strategy a success. Consequently, a strategy needs to be simple and focus on the essence of the strategy. When a strategy is clear and simple, it is easier to understand for organizational members. The need to develop a clear strategy goes against the reality of policymaking processes in the public sector. Strategies and policies are often developed in a way that reduces the level of clarity of the strategy or policy and makes implementation problematic (Baier et al., 1986). Unlike private firms, public organizations tend to be government by controlling bodies which consist of multiple and competing interests (Ring & Perry, 1981). The controlling body tends to consists of policy makers who often have different agendas, which are designed to benefit their own constituents, but not necessarily those of others in the controlling group (Nutt, 1979). Therefore, there is a need to create coalitions with multiple and often competing objectives in order to agree on a certain policy (Baumer, 1978) or strategy. A common method for securing policy support is to increase the ambiguity of a proposed policy (Page, 1976). A usual observation of policymaking processes is that ‘difficult issues are often ‘settled’ by leaving them unresolved or specifying them in a form requiring subsequent interpretation’ (Baier et al., 1986: 206). ‘Policy ambiguity allows different groups and individuals to support the same policy for different reasons and with different expectations, including different expectations about the administrative consequences of the policy’ (1986: 206). ‘Thus, official policy is likely to be vague, contradictory, or adopted without generally shared expectations about its meaning or implementation’ (1986: 206). The lack of clarity allows policy makers to show their constituents that they have successfully represented their interests (Nutt, 1979). ‘In this way, the ambiguity or a policy increases the chance of its adoption, but at the cost of creating administrative complications’ (Baier et al., 1986: 207). Thus, policy ambiguity is less the result of deficiencies of policy makers than a natural consequence of gaining the required support for the policy and of changing preferences over time (ibid). After the strategy is developed, it needs to be translated into a well worked out strategy implementation plan. Even the best strategy is worthless when managers cannot translate the strategy into operational reality. The strategy implementation plan specifies the processes, activities and operational objectives that are required to achieve the goals of the strategy. The strategic objectives need to be translated into measurable operational implementation sub-objectives (Reid, 1989) and linked to departmental and individual goals (Kaplan, 1995). In addition, progress measurement points or ‘milestones’ need to be established (Owen, 1982). Measurable objectives provide an effective basis for management control of the implementation (ibid). Research has shown that specific and ambitious but realistic goals, which are accepted by organizational members lead to the best task performance (Erez & Kanfer, 1983). People need realistic challenges to perform well. When organizational members have decided that it is impossible to reach a goal they will stop trying to reach that goal (ibid). Effective strategy implementation requires clear implementation tasks, activities and responsibilities. Implementation can only be successful when there is a clear and shared understanding of who does what, when, at what cost (Allio, 2005). Not only should the necessary actions to implement the strategy be identified and planned, responsibility for these actions should be allocated as well (Owen, 1982). By allocating clear responsibilities for the execution of the implementation activities, progress can be measured and controlled (Reid, 1989). The process of strategy implementation refers to manner in which a strategy is implemented. These are the activities leading to and supporting a strategy implementation effort or ‘how’ the strategy is implemented (Ketchen et al., 1996). The following eight practices increase strategy implementation success. During the strategy implementation effort there needs to be one clear leader who is responsible for the outcome of the strategy implementation. The strategy implementation leader serves as project manager and problem owner of the strategy implementation. The implementation leader needs to be board member, especially for strategic implementations. The implementation leader is responsible for articulating and communicating an attractive strategic vision that guides the strategy implementation. A successful leader inspires followers through the communication of a captivating vision designed to motivate followers to ambitious goals (Huy, 1999). Effective leaders have the ability to inspire confidence and enthusiasm of the new direction (Tushman et al., 1986). Implementation leaders need to be decisive during the strategy implementation effort. Taking decisions may be considered to be is the primary task of management. When taking these decisions a manager needs to be steadfast, resolved and not allow him or her to be influenced by others. Managers who want to execute ambitious and innovative plans need to be persistent in sticking the course through thick and thin (Gersick, 1994). During reorganizations in which employees can lose their job or when established power positions are threatened, considerable resistance to change can arise. In such instances of considerable resistance to change, management has to be decisive and steadfast in taking decisions. Managers need to be able to take tough decisions when organizational members are not performing well. Strategy implementation leaders need to take decisions, which are perceived by organizational members to be fair. Research has found that organizational members are more committed to decisions, decision-makers and the organization when the procedures, which were used to arrive at the decision, are perceived as fair (Brockner et al., 2000). As Brockner et al state: ‘It’s not only what you do, but how you do it’. Finally, when leaders practice moral virtues such as fairness, integrity, honesty, loyalty, determination, courage and responsibility this increases the willingness of followers to follow a leader (Guillén & González, 2001). After the strategy is formulated, it needs to be communicated to the rest of the organization, and especially to organizational participants who are directly influenced by it. However, no less than 95 percent of organizational members do not understand the strategy of their own organization (Kaplan & Norton, 2000). A strategy cannot be executed if organizational members do not know what it is. The objective is to make organizational members understand what the strategy is all about and what its goals are. Furthermore, employees need to know how the strategy influences their daily work. Communicating the strategy in a very simple way makes it easier to understand for organizational participants. An important part of the communication of the strategy is the explaining and convincing of the strategy to employees. Not only needs the content of strategy to be clearly communicated, it also needs to be clearly explained in a way that employees understand and may become convinced that the strategy is sound and effective. This can be done by explaining the advantages of the new strategy in a clear and practical way. Organizational members are more willing to accept undesirable decisions when they have received clear and adequate explanations for those decisions (Brockner et al., 1990). It is important that organizational members understand why the implementation or the new strategy is necessary. It is especially beneficial if organizational members see in their daily activities that something needs to be changed. Furthermore, a perceived crisis may also be beneficial in establishing the need for change to organizational members. When organizational participants understand the need for the strategy implementation, they are more likely to be supportive of it. Communication of the strategy can be done through a wide range of communication means, such as magazines, email, leaflets, information, and publicity meetings. However, two-way communication sessions with organizational members appear to be most effective. In these sessions, the strategy is explained and employees get the opportunity to voice their views on the strategy and its implementation. It is not only important to communicate the strategy to the people but it is also important to listen to their reactions to the strategy. Extensive listening to comments from employees can take considerable time but builds commitment to the strategy. Relevant stakeholders need to be involved in the strategy formulation and implementation process. Involving stakeholders such as middle managers, employees, customers, unions and investors may increase their commitment to the strategy. By sitting down with employees and explaining the strategy and asking for comments increases their understanding of the strategy and their commitment to it. When employees feel that they have significant input in the strategy and see that certain ideas of their own are part of the strategy they tend to be very committed to that strategy. Participation allows management to tap into the specialized knowledge of lower-level employees. This can improve the strategy and the way in which implementation tasks are performed. Furthermore, by allowing employees to participate their self-confidence can be increased. Finally, management can find out where there is support for the strategy and where resistance can be expected. Having a people-oriented management style is a key practice for successful implementation. As individuals go to work for both instrumental and social reasons, managers need to pay attention to both task performance and social relationships (Henderson & Argyle, 1986). Organizational members have the need to be treated with the dignity of a human being – one with knowledge and free will (Guillén & Gonzalez, 2001). A relationship-oriented manager listens, provides support and encouragement, coaching and counseling, develops social relations with subordinates, celebrates social activities and empowers organizational members during a strategy implementation effort. Relationship-oriented management consists of four main aspects. A first aspect is coaching and counseling employees during the strategy implementation effort. Employees eventually have to internalize the new activities, which are required to implement the strategy. Therefore, management must guide and coach the employees but they have to perform the implementation tasks themselves. Moreover, organizational members are often quite capable of performing certain implementation tasks but need help doing it. By coaching employees, they can become more confident of their abilities and can become more involved and less passive. In addition, managers can reduce resistance to change by being facilitative and supportive (Kotter and Schlesinger, 1979). This may involve giving employees time off after a demanding period and providing emotional support (ibid). A second part of relationship-oriented management is to develop and maintain personal relationships with subordinates. Better social relations have a positive influence on the cooperation, motivation and effectiveness of organizational members (Henderson & Argyle, 1986). Celebrating social activities with organizational members is a third aspect of relationship-oriented management. Organizing social activities are a good way to develop close and personal relationships among organizational members, can create a positive atmosphere within the organization, create more unity within the organization, reduce the distance between management and subordinates, and increase organizational commitment. Empowering organizational members is a final aspect of relationship-oriented management. Organizational members can be empowered by making them independent, delegating responsibilities, allowing participation, giving them more control over their work, giving them information about the strategy and its implementation, and giving training and leadership courses. Self-responsibility and self-empowerment of organizational participants makes them more motivated, more self-confident and more willing to take initiative, which is beneficial to the strategy implementation effort. In addition, empowerment or delegation has potential benefits such as improves speed and quality of decisions, reduced managerial overload, enrichment of subordinates’ job, increased motivation of subordinates and provides opportunities for the development of leadership skills of subordinates (Yukl & Fu, 1999). In addition, empowerment increases work performance (Cotton et al., 1988; Leana, 1986) and innovative behavior (Kanter, 1983). This in turn increases the motivation of organizational members by making them feel more powerful (Conger & Kanungo, 1988). Moreover, empowerment increases self-determination, which increases the self-confidence of employees. Furthermore, by giving employees more control over their work they feel more proud, important, and involved. A final reason for the delegation of authority to employees is that they are the ones who encounter the problems during their work and are thus the ones who are most suited to solve these problems. During the strategy implementation, it is important to monitor whether the goals of the implementation are being met and whether adjustments need to be made. The strategic goals translated into operational goals with performance indicators need to be monitored to assess whether the objectives are being achieved. Without concrete objectives and milestones, it is impossible to assess the progress of the execution. As strategy implementation plans are destined to change, implementation teams need to regularly meet in well-structured, punctuated sessions to share information, reconfirm priorities (Allio, 2005) and make decisions. This way, management can make adjustments when needed and thus control the strategy implementation effort. To make these adjustments it is required to assign clear responsibilities for the achievement of those targets. When objectives are not being met, the person or persons responsible need to be held accountable. When objectives are not being met it is possible that the assumptions underlying the strategy are flawed or obsolete. When this happens it needs to be decided whether incremental improvements will suffice or that a fundamentally new strategy is required. When a strategy implementation is finished it needs to be evaluated. This way, an organization may learn from the implementation, which can benefit future strategy implementations. Furthermore, it is important to conclude and evaluate a project so that employees see what they worked for, creating a sense of closure. Achieving visible improvements in performance, especially in the beginning of the strategy implementation (quick wins) increases the motivation and commitment of organizational members. When employees see that a strategy leads to visible results, they get more confidence in the strategy. Furthermore, people are more inclined to accept new things when they see that these things work and lead to results. There is often a significant fear for novelty. Consequently, strategy implementation is often perceived by employees as threatening. However, when the strategy leads to results, this fear of change can be overcome. During the strategy implementation it is important to make change visible to the organization. By making change visible (such as new logo, uniforms and offices) management can show the organization that they are committed to the strategy and that things are really changing. It is especially important to achieve results in the beginning of a strategy implementation, in order to gain the confidence of the employees that the strategy might work. This is even more important when the company is in crisis and short-term results are needed to let employees regain confidence. Another reason for achieving results is that it motivates people. If they see that the changes really lead to results then they become more motivated. Conversely, if employees get the feeling that the strategy implementation effort does not yield any results, they may even sabotage the effort. Finally, a strategy implementation project can rundown when the people see little results. Recruitment, selection, promotion and demotion should provide the managers and employees who have the required skills and attitude to implement the new strategy successfully (Kotter, 1995; Pinto & Slevin, 1987). Especially when an organization aims for radical change, new organizational members and especially managers are required to achieve it (Stoddard & Jarvenpaa, 1995). Newly hired managers are three times more likely to initiate revolutionary change than existing management teams (Tushman et al., 1986). In addition, outsiders may provide new cognitive perspectives, fresh awareness of the environment and an energizing assurance (Gersick, 1991). Existing organizational members are often comfortable with the status quo and may fear losing control, opportunities, power and their ability to accomplish the new tasks (Stoddard & Jarvenpaa, 1995). Selection and hiring of employees is especially important if the existing employees lack the knowledge and skills to implement the strategy. Another advantage of hiring new employees is that they tend to be more dynamic and can serve as an example for the existing employees, who are then expected to perform better. It can be necessary to demote or lay off employees who do not have the required skills and attitude to implement the strategy. In addition, some organizational members may have to be removed to show that resistance to change is not tolerated (Stoddard & Jarvenpaa, 1995). However, letting employees go needs to be done with great hesitation and prudence as it can have a very negative influence on survivors. When employees perceive future job loss possible, this can result in negative emotions resulting in reduced work motivation and task performance. When layoffs are inevitable it is crucial that they are clearly communicated and are done in a way, which is perceived fair by employees. Otherwise layoffs can have a very negative influence on the motivation and performance of survivors. Training and education of organizational members is another important lever for strategy implementation. Adequately trained staff is one of the most critical steps top management can take to ensure successful strategy implementation (Edwards & Sharkansy, 1978). Highly educated organizational members are more likely to adapt to intellectual demands, such as the use of information technology (Fuerst & Cheney, 1982), to be early adopters of innovations (Berry et al., 1998), are more receptive to innovation and strategic change (Wiersema & Bantel, 1992) which has a positive influence on receptivity to change. Training and education can consist of courses, collective classes, (on-the-job) training, and individual guidance and coaching. Implementing a new strategy often requires new activities and ways of thinking, which can be learned by training and educating employees. The quality of a strategy implementation effort depends on the quality of the people who have to implement it. Thus, the quality of organizational members may need to be improved by educating them. Training and education can improve employee knowledge and skills and make them perform better. Training and education may allow employees to execute their tasks in a professional and skillful way. In addition, educating and training employees can increase the self-confidence of employees and thus increase their performance. The context of a strategy implementation refers to the circumstances under which both the strategy implementation process and content are determined. It refers to the ‘where’ of strategy implementation. The following seven strategy implementation practices increase strategy implementation success. The presence of competent employees and especially management is the most important success factor for strategy implementation. Inadequate capabilities of managers are a common cause of strategy implementation failure (e.g. Beer & Eisenstat, 2000; Pinto & Slevin, 1987; Alexander, 1985). Without competent organizational members, implementing a strategy successfully becomes very difficult if not impossible. Organizational members with implementation responsibilities need to have sufficient skills and knowledge to implement the strategy. Eventually organizational members are the ones who have to perform the implementation activities to make the strategy a success.Especially, having competent management is important. When top management is incompetent, the whole organization is affected and thus the strategy implementation effort as well. Furthermore, when employees have little confidence in the ability of management to execute the strategy then their commitment to the strategy will be low. Having incompetent members within a team has a negative influence on the performance of other organizational members. Well-performing organizational members have their motivation reduced when they have to work with or are dependent on poor performing colleagues. Especially the presence of incompetent managers has a very negative influence on the performance of subordinates. If a person is competent and that person’s manager is not, this is likely to have a negative influence on the level of motivation and implementation performance. Successful organizational members tend to leave an organization when they have to work for incompetent managers and feel that their performance is not appreciated or even worked against. To increase the level of competence of organizational members several practices can be used such as training and education, coaching and counseling, giving feedback about performance, addressing poor performance, hiring and firing of organizational members and bringing in external expertise. Successful strategy implementation requires a clear organization structure that is aligned to the strategy. It needs to be clear whom the authority has to make decisions. When possible, management must ensure that the organization structure is clear, relatively decentralized and relatively formalized. When the existing structure does not meet these requirements, it may represent a hindrance to strategy implementation and needs to be changed. The main advantage of a relatively decentralized organization structure is that it increases the commitment of organizational members to decision-making; decisions can be made more quickly, and may improve the quality of decisions as it makes more use of specialized knowledge of organizational members at lower levels in the organization. Centralized decision-making, one-way top-down communication and lack of input from lower levels of the organization may inhibit strategy formulation and implementation (Kiggundu, 1996). A centralized organizational structure with rigid organizational policies combined with a perceived lack of control is related to maladaptive behavior in organizations (Martinko & Garnder, 1982). Individuals working in centralized organizations, tend to feel that management does not trust their skills and abilities resulting in a sense of incompetence (Lawler, 1992). Centralized control reduces self-determination (Spreitzer, 1996), which in turn reduces the intrinsic motivation of organizational members (Conger and Kanungo, 1988; Lawler, 1992). An explanation for this is that individuals tend to have a desire for personal control (Greenberger and Strasser, 1986). In addition, an authoritarian management style can remove control and discretion from employees, which increases their sense of powerlessness (Conger and Kanungo, 1988). Contrary, decentralized control helps organizational members feel that they are contributing to the operations of the organization, which promotes their sense of having impact (Martinko and Gardner, 1982). Furthermore, it may increase the motivation of organizational members. A moderately formalized organization structure creates clarity for organizational members. Clear procedures, rules and responsibilities give employees certainty during the implementation. When problems arise and responsibilities are not clear, organizational members may blame each other. A highly level of formalization reduces the propensity to change (e.g. Hage & Aiken, 1970; Bonoma & Zaltman, 1981). The greater the number of rules and regulations, the greater the rigidity and inflexibility within an organization. A high level of formalization discourages new ways of doing things and reinforces the status quo (Hage and Aiken, 1970). However, when formalization is low, organizational members have few rules or procedures to fall back on during the strategy implementation. Thus, organizations must not be too formalized and become rigid but also not become too informal and become chaotic and uncontrollable (Volberda, 1996). A new strategy often requires changes in the way of thinking and habits of organizational members. Old habits and ways of thinking can prove to be an obstacle to strategy implementation. Fundamental organizational change often involves major uncertainty and can trigger intense emotions, such as anxiety (Huy, 2002) and a fear for job security. As a new strategy can be accompanied by layoffs, organizational members may perceive it as a threat to job security. Job insecurity is related to a variety of negative responses such as lower job satisfaction, lower organizational commitment, lower job involvement, increased psychological withdrawal, greater resistance to change, greater propensity to leave the organization, lower trust in management (Borg & Dov, 1992) and withdrawal cognitions and behaviors including reduced work effort, increased absenteeism, and theft (Davy et al., 1997). An existing organization culture can be characterized by fear for making mistakes, responsibility, participation, and change, acting as major barriers to strategy implementation success. When managers act in authoritarian and punitive ways, subordinates may become reluctant to make mistakes and engage in learning behaviors (Edmondson, 1999). Employees may become shaped by organizations with high levels of centralization, formalization, and rigid rules and may become passive and unable to be creative or exercise initiative on the rare occasions that it is encouraged and rewarded (Martinko & Gardner, 1982). To implement a strategy successfully, proactive organizational members are needed who participate in strategy formulation and implementation. In order to participate, organizational members need to dare to take initiative, voice their opinion, and not be afraid to make mistakes. Therefore, an empowering and fearless organization culture needs to be created in which organizational members are able to make mistakes without being punished for it. When organizational member believe that well-intentioned interpersonal risks will not be punished, this fosters learning behavior (Edmondson, 1999). To change an existing organizational culture several strategies and tactics can be used. First, a very clear vision of the new organizational culture is needed. The vision must clearly describe the new culture and how it differs from the old culture what its advantages are. This needs to be communicated very clearly to the employees. Cultural change involves a lot of communication. Another tactic is to individually coach and council employees. This includes having open conversations with employees. Involve employees and give them information about their performance and the new culture. Providing training and education, especially motivational courses, can also be used to change the culture. Furthermore, visible changes, such as new uniforms and a new corporate logo can be used to make the culture change more visible and tangible to organizational members. In addition, hiring employees who have a better fit with the new culture and demoting or letting go of employees who not able to fit in the new culture are another tactic that can be used. Finally, leadership from top management is crucial in culture change. Top management need to serve as an example of the norms and values it wishes to convey to organization. However, changing a culture is a difficult and time-consuming process. It may take years to successfully change an existing organizational culture. Changing habits, which have been the same for a very long time is not easy. When organizational members have a high sense of implementation self-efficacy and believe that they can perform the new strategy implementation tasks successfully, they are more likely to perform well. Contrary, organizational members with low self-efficacy have little ambition to perform new tasks, especially more complex and unfamiliar tasks. As strategy implementation often entails new and unfamiliar tasks, this negatively influences the implementation effort. Even when organizational members do have the required capabilities they can be afraid to take on a job with more responsibility, which entails more risk. Another result of low self-efficacy may be that, organizational members can become afraid to make mistakes, take initiative, and participate in decision-making. They are not confident that their endeavors will be successful. A low implementation self-efficacy may stem from a lack of self-confidence and self-esteem. An authoritarian management style may be another source of low self-efficacy. Being in a subordinate position with little power has a negative influence on the level of self-efficacy of organizational members. In addition, when organizational members are not rewarded when they perform well but do get criticism when mistakes are made this may lower their implementation self-efficacy as well. Finally, organizational members may have low implementation self-efficacy because they have seen many things fail (including past implementations). When they see others fail, they are more likely to expect that they will fail as well. Managers can increase the level of self-efficacy of employees through coaching and counseling, rewarding performance, a people-oriented management style and by creating an organizational culture in which people are able to make mistakes and learn from them. A lack of commitment to the strategy implementation can result in implementation failure (Alexander, 1985; MacMillan, 1986). When organizational participants are committed to a strategy and its implementation, they are more motivated to implement the strategy and achieve its goals. Especially managers need to be very committed to the strategy and be resolved to implement it. Explicit management commitment is needed because management provides leadership and rewards to organizational members. However, not only is managerial commitment to the strategy required for strategy implementation success but also employee commitment. Without employee commitment, the strategy implementation is likely to fail. Employees who are not committed to a strategy will not be very motivated to implement that strategy. Organizational members may become uncommitted to the strategy implementation because of poor past implementation and organizational performance. Employees are likely to be cynical about organizational change because of the following reasons: feeling uninformed, lack of communication and respect from managers, negative disposition and lacking participation in decision-making (Reichers et al., 1997). Employee commitment can be secured by involving employees in the strategy formulation and implementation process. When employees think that it is (partly) their plan, they are more committed and supportive of the plan. Another way of increasing employee commitment is by clearly communicating the strategy to employees. Politics and struggles over power and leadership are just a few obstacles that may undermine an implementation effort (De Kluyver and Pearce, 2003). Strategy formulation and implementation inevitably raise questions of power within an organization (Pettigrew and Whipp, 1991). The existence of conflicts, and the use of individual and group power needs to be taken into consideration (Bergadaà, 1999). The very prospect of change confronts established positions (ibid), which may lead to resistance to change. Resistance to change may lead to passivity toward the strategy or even sabotage. Managers can overcome resistance to change by involving potential opponents in decision-making, taking their interests seriously and clearly communicating the new strategy and its advantages to them. Organizations need a reward system that monitors the progress toward full implementation and demonstrates top management’s interest and investment in attaining the goals of the strategy (Stonich, 1981). Reward systems are essential for motivating staff and ensuring appropriate behavior in relation to the strategy (Hrebiniak & Joyce, 1984). Rewarding good implementation performance and addressing poor implementation performance has a positive influence on strategy implementation performance, due to the following reasons. First, rewarding performance increases the level of motivation of organizational members. When organizational members perform well during a strategy implementation effort, they want to be rewarded for it. When persons are not rewarded based on their performance they are not likely to be motivated to make an extra effort and achieve results. Second, when organizational members see that another organizational member performs well and is rewarded for that, they may want those rewards as well. Consequently, they can become motivated to perform better as well. Conversely, organizational members are not motivated to work hard when their badly performing colleague gets the same salary. Finally, when organizational members are rewarded for their implementation performance their implementation self-efficacy may be increased. When they perform well and receive rewards such as compliments from management, they may be become more self-confident and more motivated to perform well during the strategy implementation. The following reward best practices have a positive influence on strategy implementation performance. First, feedback is one of the most effective methods of increasing individual and group performance (Moss & Martinko, 1998). ‘Feedback allows employees to assess their performance accurately, learn from errors, see how they are perceived by others, replace unproductive work habits, examine alternative modes of behavior, and increase self-awareness’ (Vinton, 1987). Second, informal rewards (pats on the back, a sense of pride, enthusiasm) are a very effective even more so than financial rewards. Giving compliments, praise, and recognition is really appreciated by organizational participants. By giving compliments to organizational participants when they perform well during the strategy implementation effort, management can increase their level of motivation and self-confidence. However, employees often do not receive compliments when they perform well but do get criticisms when they make mistakes. This has a very negative influence on the motivation, self-confidence, self-efficacy and performance of organizational members. Third, the use of collective rewards (such as profit sharing or bonuses with which an organization or a department as a whole is rewarded for its collective performance) has a positive influence on strategy implementation performance. Rewarding collective performance increases the level of motivation of organizational members with strategy implementation responsibilities. Collective rewards can give organizational members the feeling that they partly own the company increasing their commitment to the organization. When organizational members are partially rewarded for their collective performance they have more incentive to make their department and the organization as a whole perform better. The aim is to convey that an organization is an interdependent system – individual performance is linked to organizational performance. Dr. Arnoud van der Maas (arnoud @strataegos.com) is a strategy consultant and author in strategy execution. He is an international expert in strategy execution. Arnoud is owner of Strataegos Consulting – a strategy consultancy with a focus on strategy execution. Arnoud received a PhD in Strategy from Rotterdam School of Management, Erasmus University – one of the top business schools in Europe. This article is based on his PhD thesis on strategy execution in an international context. Connect with him on LinkedIn or follow him on SlideShare or Twitter for articles and presentations on strategy and strategy execution. Alexander, L.D. (1985) Successfully Implementing Strategic Decisions, Long Range Planning, 18(3): 91-97. Beer, M., Eisenstat, R. and Spector, B. (1990) Why Change Programs don’t Produce Change, Harvard Business Review, 68(6): 156-166. Baden-Fuller, C. and Volberda, H.W. (1997) Strategic Renewal: How Large Complex Organizations Prepare for the Future, International Studies of Management & Organization, 27(2): 95-120. Baier, V.E., March, J.G. and Saetren, H. (1986) Implementation and Ambiguity, Scandinavian Journal of Management Studies, May: 197-212. Baumer, D.C. (1978) Implementing Public Service Employment, in: May, J.V. and Wildavsky, A.B. (eds) The Policy Cycle, Beverley Hills, CA: Sage Publications, 169-197. Beer, M. and Eisenstat, R.A. (2000) The Silent Killers of Strategy Implementation and Learning, Sloan Management Review, 41(4): 29-40. Bergadaà, M. (1999) Strategic Decisions and Implementation: Prodin, a Prospective Dialectic Interpersonal Method, Journal of Business Research, 45: 211-220. Berry, F.S., Berry, W.D. and Foster, S.K. (1998) The Determinants of Success in Implementing an Expert System in State Government, Public Administration Review, 58(4): 293-305. Bonoma, T.V. and Zaltman, G. (1981) Psychology for Management, Boston: Kent Publishing. Bonoma, T.V. (1984) Making Your Marketing Strategies Work, Harvard Business Review, March/April, 62: 69-76. Borg, I. and Dov, E. (1992) Job Insecurity: Correlates, Moderators and Measurement, International Journal of Manpower, 13(2): 13-26. Brockner, J., Chen, Y., Mannix, E.A., Leung, K. and Skarlicki, D.P. (2000) Culture and Procedural Fairness: When the Effects of What You Do Depend on How You Do It, Administrative Science Quarterly, 45(1): 139-159. Brockner, J., DeWitt, R.L., Grover, S. and Reed, T. (1990) When It is Especially Important to Explain Why: Factors Affecting the Relationship between Managers’ Explanations of a Layoff and Survivors’ Reactions to the Layoff, Journal of Experimental Social Psychology, 26: 389-407. Conger, J.A. and Kanungo, R.N. (1988) The Empowerment Process: Integrating Theory and Practice, Academy of Management Review, 13(3): 471-482. Cotton, J.L., Vollrath, D.A., Froggatt, K.L., Lengnick-Hall, M.L. and Jennings, K.R. (1988) Employee Participation: Diverse Forms and Different Outcomes, Academy of Management Review, 13(1): 8-22. Cravens, D.W. (1998) Implementing Strategies in the Market-Driven Era, Academy of Marketing Science Journal, 26(3): 237-241. D’Aveni R. (1994) Hypercompetition: Managing the Dynamics of Strategic Maneuvering, New York: Free Press. Davy, J.A., Kinicki, A.J. and Scheck, C.L. (1997) A Test of Job Security’s Direct and Mediated Effects on Withdrawal Cognitions, Journal of Organizational Behavior, 18(4): 323-349. Drazin, R. and Howard, P. (1984) Strategy Implementation: A Technique for Organizational Design, Columbia Journal of World Business, 19 (summer), 40-46. Edmondson, A. (1999) Psychological Safety and Learning Behavior in Work Teams, Administrative Science Quarterly, 44(2): 350-383. Edwards, G.C. and Sharkansky, I. (1978) The Policy Predicament: Making and Implementing Public Policy, San Francisco: W.H. Freeman. Erez, M. and Kanfer, F.H. (1983) The Role of Goal Acceptance in Goal Setting and Task Performance, Academy of Management Review, 8(3): 454-463. Flood, P.C., Dromgoole, T., Carroll, S.J., and Gorman, L. (eds) (2000) Managing Strategy Implementation, Oxford: Blackwell Publishers. Fuerst, W.L. and Cheney, P.H. (1982) The Factors Affecting the Perceived Utilization of Computer-Based Decision Support Systems in the Oil Industry, Decision Sciences, 13(4): 554-569. Gersick, C.J.G. (1994) Pacing Strategic Change: The Case of a New Venture, Academy of Management Journal, 37(1): 9-45. Guillén, M and González, T.F (2001) The Ethical Dimension of Managerial Leadership Two Illustrative Case Studies in TQM, Journal of Business Ethics, 34(3/4): 175-189. Greenberger, D.B. and Strasser, S. (1986) Development and Application of a Model of Personal Control in Organizations, Academy of Management Review, 11(1): 164-177. Hage, J. and Aiken, M. (1970) Social Change in Complex Organizations, New York: Random House. Harvard Business Review (2006) Building the office of strategy management, Harvard Business Publishing Newsletters, august 09. Hauc, A. and Kovac, J. (2000) Project Management in Strategy Implementation – Experiences in Slovenia, International Journal of Project Management, 18: 61-67. Henderson, M. and Argyle, M. (1986) The Informal Rules of Working Relationships, Journal of Occupational Behavior, 7(4): 259-275. Hrebiniak, L.G., and Joyce, W.F. (1984) Implementing Strategy, New York: Macmillan Publishing Company. Huy, Q.N. (1999) Emotional Capability, Emotional Intelligence, and Radical Change, Academy of Management Review, 24(2): 325-345. Kanter, R.M. (1983) The Change Masters, New York: Simon and Shuster. Kaplan, R. (1995) Building a Management System to Implement Your Strategy: Strategic Management Survey: Summary of Findings and Conclusions, London: Renaissance Solutions. Kaplan, R.S. and Norton, D.P (2000) The Strategy Focused Organization, Harvard Business School Press. Kaplan, R.S. & Norton, D.P. (2005) Creating the office of strategy management, working paper, April. Kaplan, R.S. and Norton, D.P (2008) The Execution Premium, Harvard Business School Press. Kaplan, R.S. and Norton, D.P (2008b) Mastering the Management System, Harvard Business Review, January. Ketchen, D.J., Thomas, J.B. and McDaniel, R.R. (1996) Process, Content and Context: Synergistic Effects on Organizational Performance, Journal of Management, 22(2): 231-257. Kluyver, de, C.A. and Pearce II, J.A. (2003) Strategy: A View from the Top: An Executive Perspective, Pearson Education, Upper Saddle River: Prentice Hall. Kotter, J.P. and Schlesinger (1979) Choosing Strategies for Change, Harvard Business Review, March-April, 106-114. Lawler, E.E. (1992) The Ultimate Advantage, San Francisco: Jossey-Bass. Leana, C.R. (1986) Predictors and Consequences of Delegation, Academy of Management Journal, 29(4): 754-774. MacMillan, I.C. and Guth, W.D. (1985) Strategy Implementation and Middle Management Coalitions, Advanced Strategic Management, 3: 233-54. Martinko, M.J. and Gardner, W.L. (1982) Learned Helplessness: An Alternative Explanation for Performance Deficits, Academy of Management Review, 7: 195-204. Miles, R.E., Coleman, H.J. and Douglas Creed, W.E. (1995) Keys to Success in Corporate Redesign, California Management Review, 37(3): 128-145. Mintzberg, H. (1990) Strategy Formation: Schools of Thought, in: Frederickson, J.W. (1990) Perspectives on Strategic Management, Harper & Row. Noble, C.H. (1999) The Eclectic Roots of Strategy Implementation Research, Journal of Business Research, 45: 119-134. Noble, C.H. (1999b) Building the Strategy Implementation Network, Business Horizons, November-December, 19-28. Nutt, P.C. (1979) Calling out and Calling off the Dogs: Managerial Diagnosis in Public Service Organizations, Academy of Management Review, 4: 203-214. Nutt, P.C. (1983) Implementation Approaches for Project Planning, Academy of Management Review, 8(4): 600-611. Nutt, P.C. (1999) Surprising but True: Half the Decisions in Organizations Fail, Academy of Management Executive, 13(4): 75-90. Page, B.I. (1976) The Theory of Political Ambiguity, American Political Science Review, 70: 742-752. Pettigrew, A. M. (1985) The Awakening Giant: Continuity and Change in ICI, Oxford: Basil Blackwell. Pettigrew, A.M. and Whipp, R. (1991) Managing Change for Competitive Success, Oxford: Blackwell. Pinto, J.K. and Slevin, D.P. (1987) Critical Success Factors in Successful Project Implementation, IEEE Transactions on Engineering Management, 34(1): 22-27. Reichers, A.E., Wanous, J.P. and Austin, J.T. (1997) Understanding and Managing Cynicism about Organizational Change, Academy of Management Executive, 11(1): 48-59. Ring, P.S. and Perry, J.L. (1985) Strategic Management in Public and Private Organizations: Implications of Distinctive Contexts and Constraints, Academy of Management Review, 10(2): 276-286. Schofield, J. (2004) A Model of Learned Implementation, Public Administration, 82(2): 283-308. Spreitzer, G.M. (1996) Structural Characteristics of Psychological Empowerment, Academy of Management Journal, 39(2): 483-504. Stoddard, D.B. and Jarvenpaa, S.L. (1995) Business Process Redesign: Tactics for Managing Radical Change, Journal of Management Information Systems, 12(1): 81-107. Stonich, P.J. (1981) Using Rewards in Implementing Strategy, Strategic Management Journal, 2(4): 345-352. Thomas, L.C. (2002) The Nature and Dynamics of Counter-Implementation in Strategic Marketing: A Propositional Inventory, Journal of Strategic Marketing, 10: 189-204. Tushman, M.L., Newman, W.H. and Romanelli, E. (1986) Convergence and Upheaval: Managing the Unsteady Pace of Organizational Evolution, California Management Review, 29(1): 29-44. Vinton, D. (1987) Delegation for Employee Development, Training and Development Journal, 41(1): 65-67. Volberda, H.W. (1996) Toward the Flexible Form: How to Remain Vital in Hypercompetitive Environments, Organization Science, 7(4): 359-387. Wernham, R. (1984) Bridging the Awful Gap Between Strategy and Action, Long Range Planning, 17(6): 34-42. This article is based on my PhD thesis on strategy execution.